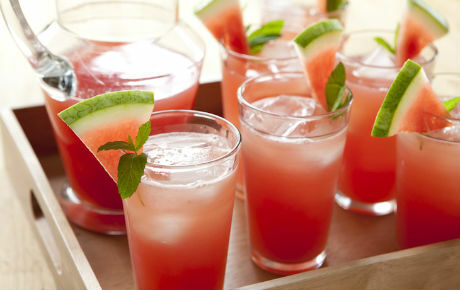 RECIPE: WATERMELON LEMONADE - What About Watermelon? Watermelon is 92 percent water, so it only makes sense to use it as an ingredient in a drink. In fact, one of my favorite things to do when eating a large slab of watermelon is to slurp the juice that collects like little lakes in the watermelon as I eat it. I don’t care if people think I’m ill-mannered. They’re just jealous. Place watermelon, raspberries and water in container of electric blender, cover and blend until smooth. Strain through fine mesh strainer into pitcher. Stir in sugar and lemon juice until sugar dissolves. Refrigerate until chilled, about 1 hour. Makes 4 servings (or just one really big one for yourself).